I had the pleasure of meeting comic book writer Tony Isabella in October 2017. Tony is the creator of the DC Comics first African American superhero Black Lightning. During my time with Tony Isabella at the Grand Rapids Comic-Con, I asked him what was his favorite comic book issue to work on. Without hesitation, he said Black Lightning Volume 2 Issue 5. Tony went on to explain why he enjoyed the comic book so much. Black Lightning’s civilian identity is Jefferson Pierce, the principal at Garfield High School. Pierce dons the Black Lightning costume to protect his students from the gangsters who want to recruit them to their gangs and do them harm. In the Black Lightning comic recommended by Tony Isabella, something goes wrong. Walter Kasko, a teacher at Garfield High School, tosses himself in front of a young student named Lamar as gangsters burst into the room Walter, Lamar, and Jefferson was. Walter was riddled with bullets and died. Jefferson was injured and spent time in the hospital. During his stay in the hospital, Jefferson Pierce doubted himself. He doubted his ability to protect and be a superhero. Afterall, a man with no powers gave his life to save the life of Lamar when Jefferson was unable to act. Walter Kusko was older than Jefferson Pierce/Black Lightning. He was 30lbs overweight. He ate, drank, and smoked. And yet he moved. Walter took action when Black Lightning couldn’t. 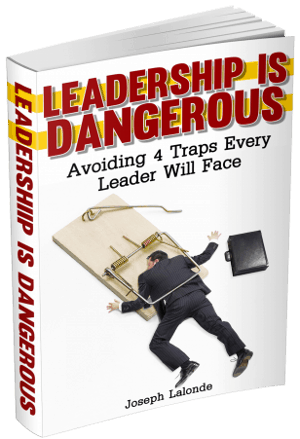 When leaders begin to doubt themselves, they begin to fall into the comparison trap. They look at other leaders who they see are crushing it. They then look at themselves and see themselves as something less. The comparison trap is dangerous. You’re comparing yourself to the highlights of other leaders, not their day to day lives. For Walter, his heroic action was one moment. Jefferson saw this and had trouble moving past it. Don’t be like Jefferson. Don’t compare yourself to someone else’s highlight reel. Jefferson then began to recall his failures. He saw the names and faces of the people he couldn’t save. Over and over again, his failures replayed in his mind. Taunting him and telling him he wasn’t a hero. He wasn’t anything special. His thoughts were wrong. The other things leaders do when they doubt themselves is to replay their bloopers reel. You can easily find yourself replaying your screwups in your mind. Your memories of failures will come easily when you doubt yourself. You want a reason to believe you’re not good enough at those times. But great leaders know they must pull themselves together. They’re not bad, they’re human and they’ve had to make choices. Those choices may not result in the best outcomes but they’re made. And leaders own up to those choices. In issue 5 of Black Lightning, you also get to see the change happen to Jefferson Pierce as he pulls himself out of his doubt rut. 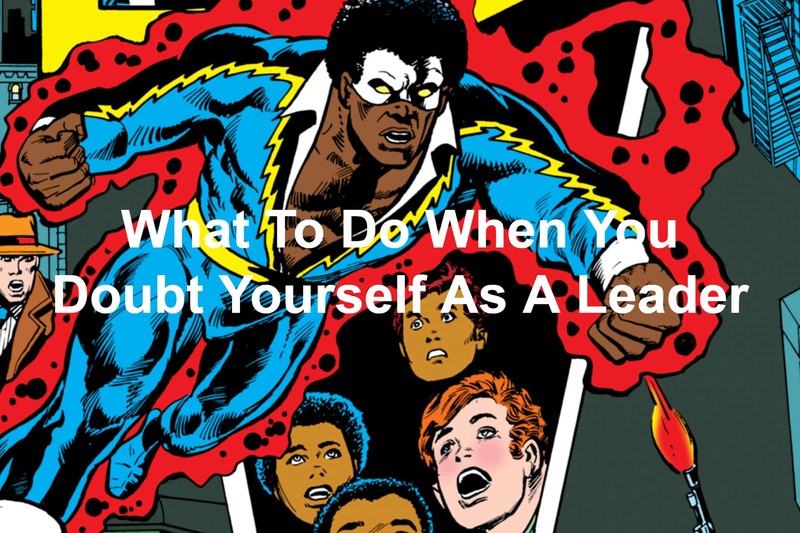 Jefferson Pierce did the following things to rid himself of his doubt and don the mantle of Black Lightning once more. As Jefferson was laying in the hospital bed, he recalled why he became Black Lightning. 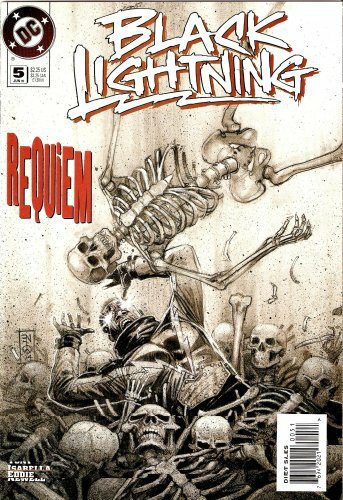 His reason for becoming Black Lightning was to fight the gangsters who were preying on his students without endangering those students. Jefferson had to recall the WHY behind his actions. Why did he fight gangsters? Because there were people counting on him. Do you remember WHY you became a leader? You became a leader to help people. To show them the way to a better life and a better workplace. You have people counting on you. Remember that. The next thing Jefferson did was to recall the villains he had taken down and the good people he saved. Black Lightning recalled his victories. You have to remember your victories in leadership. Write down your victories in a journal. Keep the journal close so you can reference your wins when you’re feeling doubt creep in. There’s no quicker way to beat doubt than to see the good you’ve done and the people you’ve helped. Don’t forget that! Another step Jefferson took to beat doubt was he began to recall the friendships he’d made as a superhero. Black Lightning had become a member of the team called The Outsiders. The various team members meshed well. They quickly became friends as well as heroes. Isolation will quickly lead you to doubt yourself. You will have no one to cheer you on and encourage you when you’re down. Having a group of friends you can call on in your time of need will help you realize you still have something to offer the world. I’ve known this for a long time but failed to practice this step to overcoming doubt. Thankfully, I’ve joined two “superhero” teams myself. I regularly meet with 3 men (Bobby Hill, Martin Himmel, and Rick Thuele) to discuss what’s going on in life. Recently, I joined the second group we call The League Of Extraordinary Gentlemen (yes, we ripped off the name of the group from another DC Comic book series created by Alan Moore). These groups help remind us that we are more than we believe we are. They hold us accountable and encourage us. Go find yourself a group of friends to do the same. When Jefferson’s ex-wife showed up at the hospital, she encouraged Jefferson to talk about his feelings. As Jefferson began to share, he realized he was feeling a wide range of emotions. How he was angry for being shot. Bad because Walter died. Helpless because he can’t protect Lamar because he’s laid up in the hospital. Most of all, he feels overwhelmed. Us men can struggle to share our feelings. Sharing feelings isn’t something that comes naturally to most men but can be helpful. Going over what you’re feeling helps you to realize what you’re actually feeling rather than just thinking you know what feelings you have. Verbalizing does something special and triggers you to think about what’s going on in your head. Don’t be afraid to sit down with someone and share your feelings. Find a close friend. Go to a counselor. Talk with your wife. Let yourself share your feelings and express them. You’ll discover your feelings go deeper than you thought. Some things never change, do they? You’ve accomplished so many things, helped so many people, and you weigh yourself down with the times you didn’t succeed, the ones you couldn’t help. Stop denying what you are Jeff, you’re a good man and then some. You’re a superhero just as real as they come in a world that’s $#@% hard on heroes. You haven’t made compromises, you’ve made choices… and they’ve been the right choices for you.. you can made it a better world. Don’t you know how special you are? The stirring speech by his ex-wife was impactful in the Black Lightning comic book. His wife knew WHO Jefferson really was. He wasn’t a weak man or a failure. He was a hero who saved lives and changed the city he lived in. You need someone to speak truth to you. You can’t hide from the cold, harsh truth that actually warms you when you hear it. Wouldn’t you say the words his ex-wife spoke were tough? But they were also true and kind. They painted a picture of WHO Jefferson was from a person who KNEW him intimately. Find yourself someone who’s willing to be blunt with you. Their words may hurt but those words will also heal in time. Dealing with doubt is a struggle because doubt is a mental game. However, I know you can overcome your doubt. Especially when you follow the steps laid out above. Have a team to call on. Have someone to set you straight. Question: How do you overcome doubt when you face it? Let me know your strategies for overcoming doubt in the comment section below.